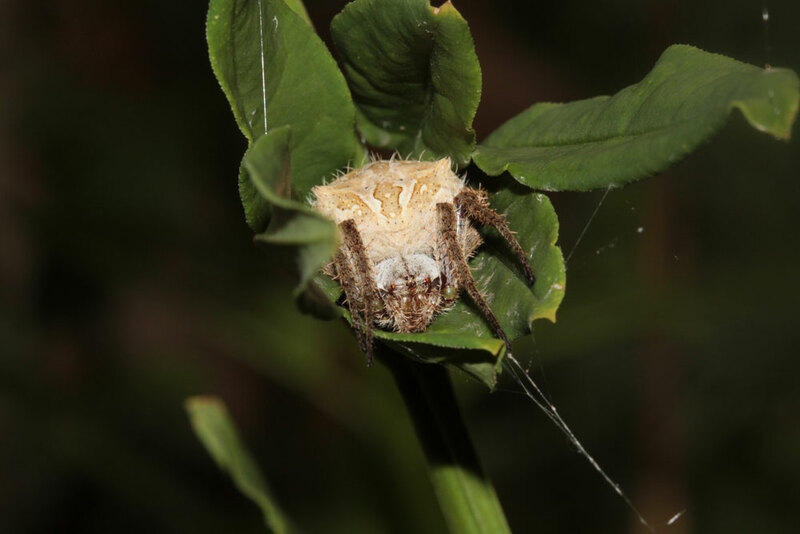 Wonderful, a garden orb weaver (Eriophora pustulosa), is living a very active life. (See the previous blog for her introduction.) Last night, she was hanging around on her web, just as garden orb weavers should. Please click on the images - I'm rather proud of these! She collected a lots of food on a hot, moist night - the first rain for months had just started dribbling. She was soon feeding on two wasps she'd bound together. ... she returned to dinner. The rain started. She headed under a leaf at the edge of her web. And took up her usual resting position, one foot on her main web thread to detect any newly ensnared insect. When the rain got heavy, she bound the leaves around her into a shelter. And there she sat out the storm. Love this spider! She's Wonderful! awesome little girl. are those nodes on her back normal? Yes, ZBra, they are the identifying feature of this species, Eriophora pustulosa. The larger garden orb weaver who I blogged from our previous home was E. biapicata. They have the two nodes on her 'shoulders', but not on the end of the abdomen. E. pustulosa has three more on the end of the abdomen. 'Wonderful' has one of those three rear ones very prominent and the other two very subtle. I can see them in some photos - just. I am taking lots of her every day and night. She's very tolerant. A compliment from you two is a compliment indeed, given the superb quality of your photography. Thank you!